The science has already shown elderberry extract is 99% effective against the Avian Flu (H5N1) virus in cell cultures, so now the point is simply. getting. it. made. 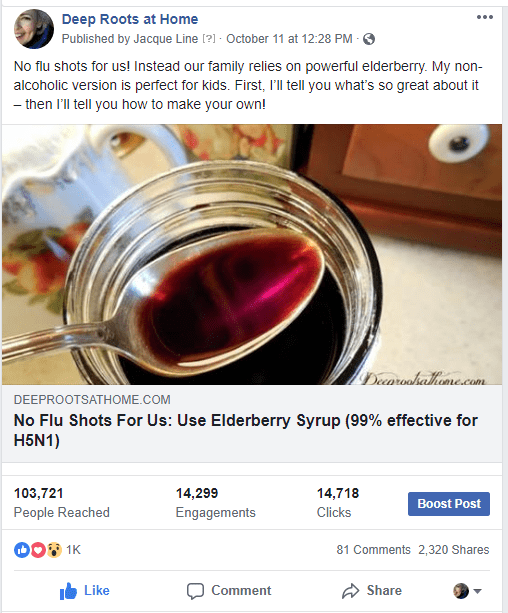 I believe that this post over on Facebook has been viral this week because there is so much interest in NOT taking the flu shot: No Flu Shots 4 Us: Use Elderberry Syrup (99% effective for H5N1). <<—-This post contains the stove top version. Syrup making is so much faster and many want to get a jump on! Using the Instant Pot is faster still! Buy dried elderberries here and here. Angela stated this recipe makes about 3 1/2 cups or 28 ounces. That should be enough elderberry syrup for 6 people all winter when taken at the first sign of a cold or flu (but not everyday). (See dosage below). If you want to take a 1/2 teaspoon a day preventatively (as many do), triple or quadruple (3-4x) the recipe for 6. It will be effective for one season (at least 4 months – and probably 5). The cloves, cinnamon, ginger and honey are all excellent natural preservatives, so it keeps well and will not go bad when refrigerated. Put everything except the honey in the Instant Pot, seal and press the manual setting to high pressure for 15 minutes. After it beeps, simply quick release the pressure or allow to release naturally. Once cooled, strain the liquid off from the berries using cheesecloth, thin old clean towel or a coffee filter. Be sure to squeeze all of the liquid out of the berries…this is medicine you don’t want to waste! When syrup is a bit warmer than room temperature, but not at all hot, put in honey. The raw honey will lose the powerful healing antimicrobial enzymes and natural antibiotic components if heated! Store in the fridge…That’s it! The very best time to start treating a cold or flu virus with elderberry tincture or syrup is at the very earliest stage, BEFORE the virus has gotten a foothold, as in, “I think I may be coming down with something, but I’m not quite sure”. If the risk of exposure to ordinary flu is very high, we adults take two tablespoons of elderberry syrup (or a dropperful of the vodka-based tincture) every four to six hours at the first sign of a cold or flu. For children under 12 years old, administer 1 teaspoon elderberry syrup per day when risk it high or 1 teaspoon per waking hour at the very onset of cold/flu-like symptoms. (1 1/2 years – 3 years old) get half of that. Do not give it under 1 year of age if made with honey. Substitutes for honey would be brown rice syrup, molasses, or maple syrup. If you don’t have a source of fresh elderberries where you live, it’s easiest to buy online bulk dried organic elderberries. A 1 pound bag should contain 5 cups for making 5 x this recipe. You can also find them at health food stores, and if the dried berries are all out you can use Sambucol products. And ask locally. Many people are making this remedy and selling it because it works so well, but know your source! Thank you for posting this! Now I just need to follow through! I own a daycare center and the germs are already starting to run wild. I need to do this!!! Jean, I have an idea! Could you give the recipe to the moms and maybe some will make it!? Sounds great but I do not have an instant pot and do not plan on getting one. Is there a version of this recipe that I can use? I hope that helps, friend! I love how easy it is but last year I thought i saw warnings for making this. That you had to boil it for 45 mins to remove some toxins from the actual berries. Have you seen this? Just wondering what your opinion on it was. Jen, thanks for your question. Yes, you need to cook them, but 30 minutes is plenty acc. to the sources. That said, elderberry tincture has been made and used since in folk medicine and Native American medicine for hundred, perhaps several thousand years with out it being contraindicated. We have grown our own berries and used it for at least 22 years, in times of thinking we had flu, with no side effects of any kind. The neighbor who taught me how to make it, died at 104 years old as clear mentally as a bell 😀 so I think nothing of it. Can I put the required daily amount in smoothies and get the same benefit? I don’t see any way to download the PDF recipe. Or to subscribe either, for that matter! The click link window doesn’t have another activating button when it opens, just the option to close it. Denelle, to print or get a PDF, look right above the top photo on the left. I took a screen shot, but realize I can’t post one here. It is working for me. To subscribe, look right at the very top of the home page. It says “Stay healthy this flu season! 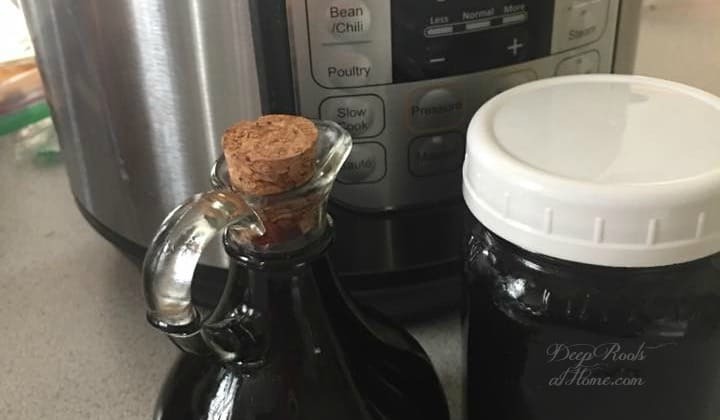 Make your own Elderberry Syrup… easy recipes!” You can subscribe there. 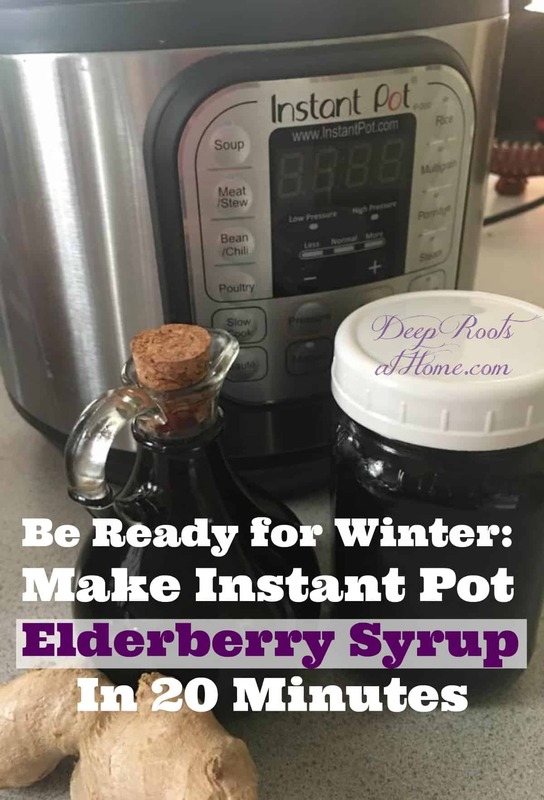 Also, there are several more links in the post that say, “Get the free printable Elderberry Recipes PDF!” They also are working fine. I just made a batch of the syrup in my Instant Pot. The house smells wonderful. My husband and I will start using this right away. Thanks for all your tips. They were so helpful! Can you tell me how many ounces the syrup recipe will make? I’m trying to compare it cost-wise to ready-made syrups such as Sambacol (which I buy for 44¢ per ounce). Jacqueline, I think your math is a bit off. I agree that the above recipe makes 3.5 cups of syrup, but that equals 28 ounces, not 72! I was gathering my ingredients and scrambling to find enough jars for 72 ounces when I realized that the recipe couldn’t yield that much. Thank you. Sorry for the bother – I could have just looked up at the title of this article! I just discovered the locally made syrup I bought last year for 44¢ an ounce is no longer available. Online, I found a 4 oz. bottle of Sanbucal is $12.99 – that’s $3.25 per ounce! PLUS the ingredient list shows glucose syrup (not honey). 1 cup of dried elderberries would cost me $5.40 and 1 cup of raw honey is $9.70. So total cost for 74 ounces of syrup is $15.10. I’m not counting cinnamon, ginger and cloves because they are not in the purchased syrup. So, I can make this recipe for between 20¢ and 21¢ per ounce = a little more if I add cinnamon, ginger & cloves. I will be making my syrup this year! Thank you for the recipe! Your cost analysis is great information, Vicki! I may have to add that to the post 😀 It was no bother! Hi Jacqueline! I just started making and using elderberry syrup this year. We’re taking it every day as a preventative measure. The IP recipes I had seen said 7 minutes, but yours says 15. Do you know what the difference would be? I certainly want to do it correctly so we’re getting full benefits. Instinct tells me that anything over 10 minutes is best to fully extract the polyphenols. I think we can safely and reasonably do 10-12-15 minutes and have an excellent product, but that is just my opinion. Can you make it using fresh elderberries that were frozen? What are the quantities? Just read your recipe here. I have a quantity of elderberries to use. They have been frozen and are thawed now in the refrigerator. They aren’t dried so I would like to know if they are good to use to make the syrup. How many cups would I use? Hi, Laurie! Yes, frozen would be the same as using dried elderberries with an adjustment for the extra water they hold. They would still have the same amount of flavonoids in them. If I were making it, I’d use 3 cups instead of 1. And I would cut the water back to 3 cups instead of 4. It isn’t critical on the ratios; you are using the water to extract the flavonoids and so it may be a bit thicker or thinner is all. I hope that helps. 😀 Blessings! Thanks! Excited about doing this.